An “ultimate bubble” in gold could be an offspring of the mother of all carry trades, but its magnitude would depend not only on the effective value and rate of change in value of the US dollar while the carry trade is booming, but also on the actual, eventual value of the US dollar (in real terms) after the carry trade has come to an end. Although the value of the US dollar will certainly recover to some degree when the carry trade ends, it will remain significantly lower in value for other reasons. In the above mentioned interview, Mr. Soros went on to say that "Some countries, like the US and European countries have plenty of room to increase their deficits; [although] the political resistance to doing so increases the chances of a double dip [recession] in the [global] economy in 2011 and after that." Since further monetary inflation as a consequence of government deficit spending may be necessary to maintain economic stimulus measures and financial system life support, Mr. Soros anticipates further devaluation of the US dollar. 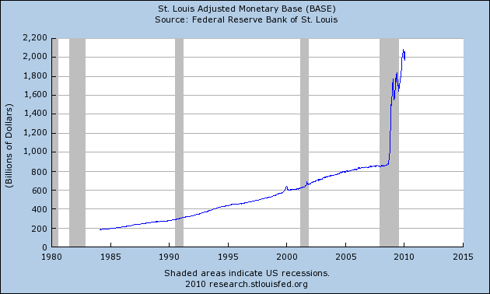 Devaluation of the US dollar will have both beneficial and harmful effects on the US economy. Devaluation of the US dollar will reduce the value of debts in real terms, reducing the overall debt to GDP ratio of the US economy, and stimulate nominal GDP growth as domestic prices and wages (at different rates) adjust to the altered value of the US dollar, while at the same time helping to create conditions where US banks can resume lending to consumers and small businesses. Unfortunately, currency devaluation also has deleterious effects, such as higher prices, a loss in the value of savings and a reduction in the real value of wages. There is also a risk of uncontrolled domestic price inflation (although prices can be held in check without raising interest rates by curtailing the flow of money and credit to consumers and small businesses). 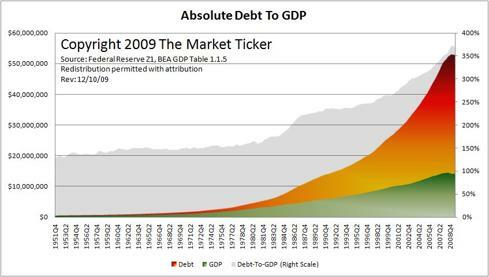 In addition to reducing the US debt to GDP ratio, devaluation of the US dollar will lessen the risk of higher interest rates resulting in greater deficit spending by the US government as a consequence of increased debt service ($145.4 billion in fiscal 2009) since it will allow the US federal government’s tax receipts to grow faster than the increase in debt service resulting from higher interest rates. Currently projected US federal government borrowing (or, alternatively, quantitative easing) will maintain downward pressure on the value of the US dollar through the year 2019. According to the US Office of Management and Budget’s (OMB) baseline projection of current policy, federal deficits will total between $7 and $9 trillion for fiscal 2010 through fiscal 2019 and the US public debt will grow from $12.3 trillion to more than $16 trillion in 2019. Other estimates indicate that US federal government debt will exceed $18 trillion in 2019, setting aside the net present value of unfunded federal liabilities based on Generally Accepted Accounting Principles (GAAP). According to David M. Walker, former Comptroller General of the United States from 1998 to 2008 and current President and CEO of the Peter G. Peterson Foundation, current federal liabilities and unfunded obligations total approximately $63 trillion. 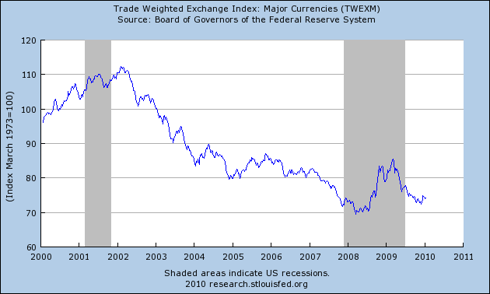 As a result, further devaluation of the US dollar is inevitable. 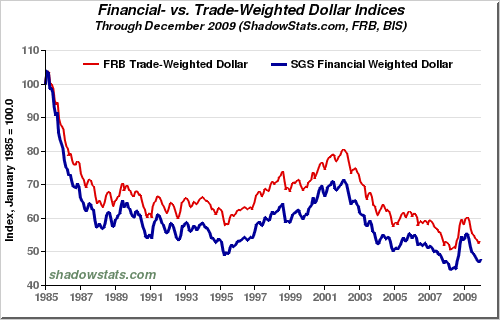 Curiously, the US dollar has two different and diverging values, one within the US financial system and another in the broad US economy. 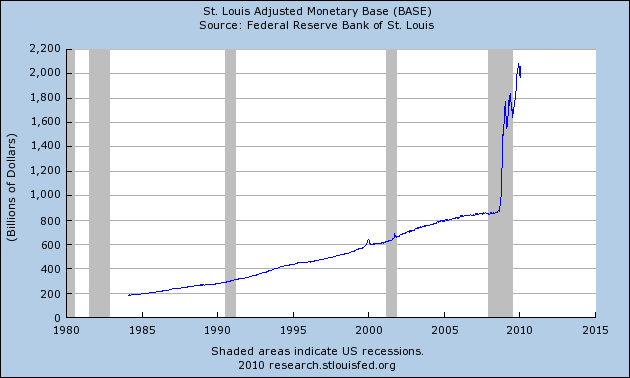 As a result of the US financial system rescue, which included purchases of various assets from banks at book value by the US Treasury and Federal Reserve, the US monetary base has expanded roughly 150% since the beginning of the global financial crisis in 2008, but the newly created currency has not filtered into the broad US economy where, in contrast, deflationary pressures persist. Although it is not apparent in the broad US economy, the value of the US dollar has been dramatically altered and its devaluation cannot be isolated indefinitely within the financial system independent of the broad US economy. 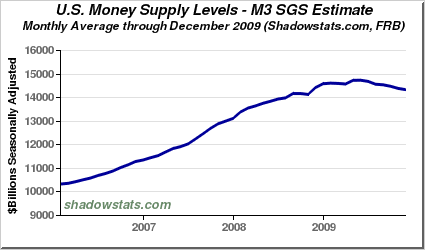 The counterbalancing, but much smaller, contraction of the broad US money supply, as measured by the M3 monetary aggregate, also cannot continue indefinitely. At some point, the two disparate values of the US dollar (that found within the financial system versus that found in the broad US economy) will be reconciled and, unless current policies are reversed, the outcome will be a substantially less valuable US dollar. The consequences of the eventual reconciliation will certainly include price inflation in the US, higher US dollar prices for commodities that are subject to global demand, such as oil and gold, as well as higher nominal values for US dollar denominated assets. However, the potential unintended consequences of a falling US dollar include high domestic price inflation, a further reduction in international demand for US debt or a collapse in demand, a disruptive decline in trade, i.e., US imports, or in the worst case, rejection of the US dollar as the world reserve currency or a hyperinflationary collapse of the US dollar. 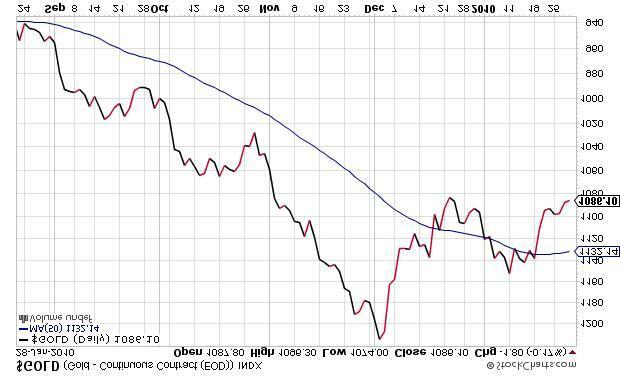 Is Gold in an Asset Price Bubble? Diversification for the purposes of risk mitigation and wealth preservation is a rational response to unstable market conditions and is not comparable to a market mania, like the dot-com bubble. Similarly, a long-term shift in asset allocation favoring one general category of assets over another based on fundamentals, while it may result in rising prices, does not by itself describe an asset price bubble. An asset price bubble, such as the Dutch tulip mania of the 1630s, is an irrational and economically unsustainable investment trend that holds sway over investors only temporarily and that inevitably collapses violently. Asset price bubbles end when a tipping point is reached where the awareness of and tolerance for escalating risk exceed irrational exuberance producing a panic. So long as the great majority of market participants discount risk, individual participants may rely on the irrational exuberance of others. In contrast, rational confidence does not depend on a majority of market participants behaving irrationally and is based instead on sound fundamentals. The view that rising global commodity prices, fundamentally, are asset price bubbles in various stages of formation unreasonably discounts the risks associated with financial institutions, governments and currencies. If we are to learn anything from Iceland, the Baltic states, Dubai, and Greece it is that if irrational exuberance exists in the financial markets today it is exactly confidence that is not based on sound fundamentals in financial institutions, governments and currencies. In the 1980 asset price bubble, gold rose from an inflation adjusted low using constant 2009 dollars of $392.57 per Troy ounce on August 31, 1976 ($104 1976 dollars) to its January 21, 1980 peak of what would have been $2,358.04 in 2009 dollars ($850 1980 dollars), a gain using constant 2009 dollars of more than 500% in 4 years. 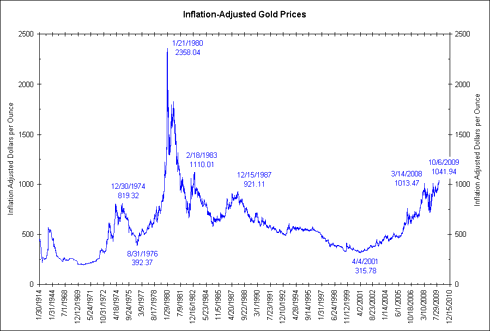 The 1980 asset price bubble in gold violently collapsed in same year, returning to 1979 levels by 1982. Chart courtesy of Bianco Research, L.L.C. 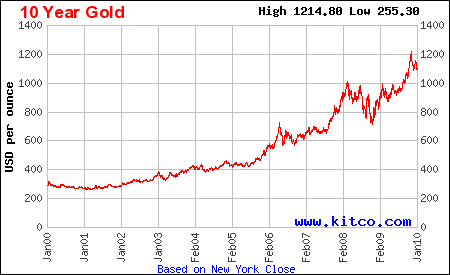 On April 4, 2001, the gold price would have been $315.78 in constant 2009 dollars, the lowest value since 1970 adjusted for inflation. From that point, the gold price rose from a nominal low of $255.95 on April 4, 2001 to a nominal high of $1,212.50 on December 2, 2009 (London PM fix), a gain of roughly 375% over approximately 10 years (284% using constant 2009 dollars). 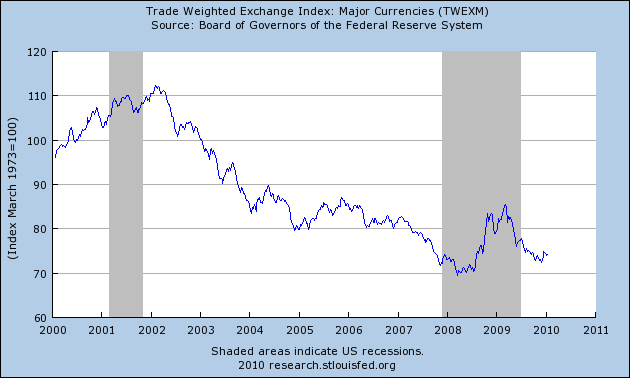 Chart courtesy of Kitco Metals Inc.
Over the past decade, the US dollar has declined from its 2002 high by roughly 33% compared to other major currencies and approximately 40% from is 2000 high compared to the Euro. At the same time, most of the currencies in the major indices have been debased alongside the US dollar since 2008 for the same reasons, thus the value of the US dollar in real terms is not apparent from the index alone. The alternate US Dollar Indices published by Shadow Government Statistics (SGS) suggest that the Federal Reserve’s trade weighted exchange index of major currencies, which includes the Euro zone, Canada, Japan, the United Kingdom, Switzerland, Australia, and Sweden, may be an optimistic formulation. The decline of a national currency, particularly that of a nation with a large trade deficit, is first apparent in international trade while domestic prices do not at first fully reflect the devaluation of the currency. 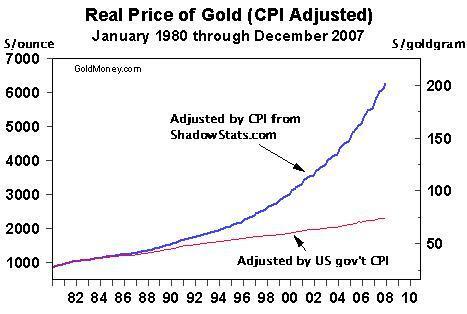 As a result, the prices of commodities that are subject to global demand tend to rise before the general increase in domestic prices that results from currency devaluation, thus the prices of commodities such as gold would be expected to rise faster than domestic measures such as the US Consumer Price Index (CPI). The alternate CPI measure provided by SGS may represent a more accurate method of estimating the US dollar prices of commodities that are subject to global demand. 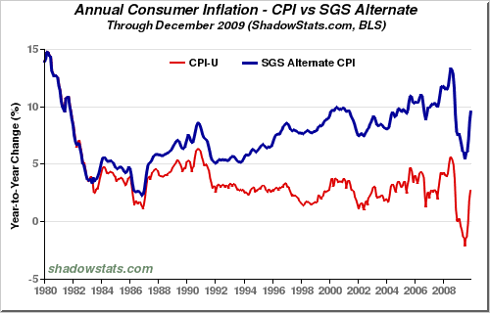 The SGS alternate data show accelerating price inflation over the past decade leading up to the global financial crisis in 2008. If the SGS alternate CPI data are applied to the gold price it is apparent why Shadow Government Statistics’ John Williams stated in an interview with Bloomberg reporter Pham-Duy Nguyen that if the same methodology of measuring inflation were used today as in 1980, the 1980 gold price would be equivalent to $7,150. 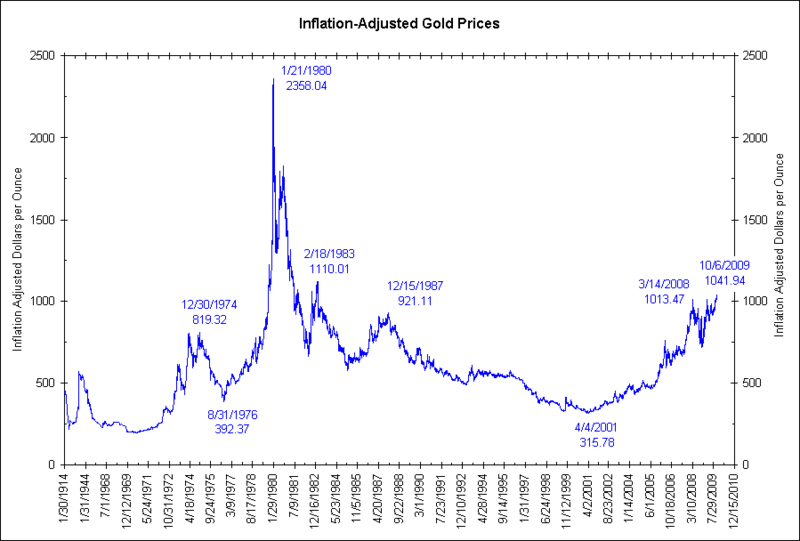 While gold certainly has enjoyed tremendous gains over the past decade, including the effect on the gold price of central bank gold demand, the current gold price, following on the heels of an unprecedented global financial crisis, has little in common with the 1980 asset price bubble. The current gold price reflects a rational diversification into hard assets for the purposes of risk mitigation and wealth preservation and can be explained in terms of monetary inflation and associated loss in the value of the US dollar independent of the US dollar carry trade. 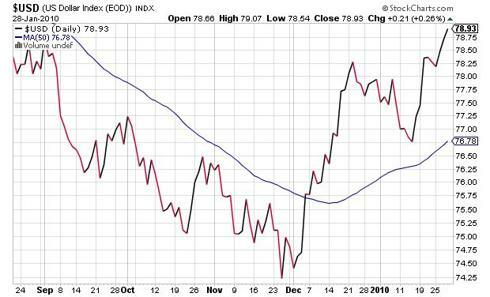 The continuing devaluation of the US dollar will result in a further rise in the prices of commodities that are subject to global demand, thus the gold price will continue to rise also. Mr. Soros is certainly correct in that low interest rates contribute to the formation of asset price bubbles, but neither the value of the US dollar or the price of gold depend only on interest rates or on the US dollar carry trade. 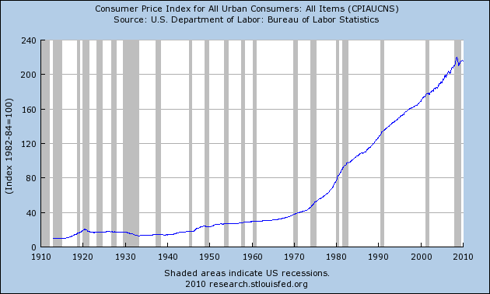 The view that a gold price over $1000 per Troy ounce represents the “ultimate bubble” ignores the ongoing devaluation of the US dollar, discounts risks associated with the stability of financial institutions, governments and currencies, and does not reflect confidence consistent with sound fundamentals.